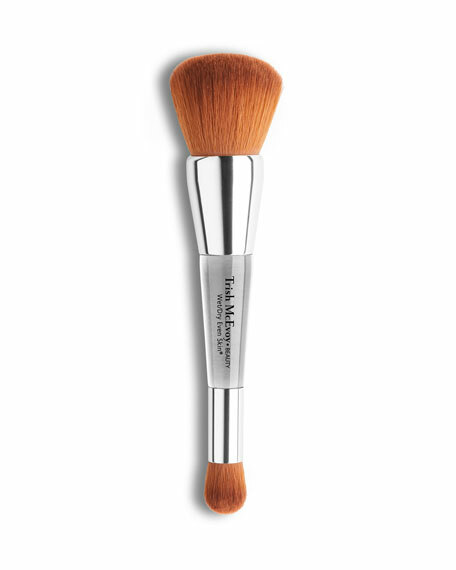 Designed for the seamless full-coverage application of any skin perfectors, this luxurious dual-ended brush is hand-made with the softest, highest-quality synthetic hair. The large head is domed to perfectly distribute any texture foundation while the smaller tapered point conforms to curves and small areas for a flawless professional finish of your under-eye and face concealers. Dual-ended, travel-friendly brush. Made from supremely soft, PETA-approved, high-grade Taklon bristles, an excellent alternative for those who suffer from allergies to animal hair. Weighted metal handles provide control for easier blending and application. Brushes may be used wet or dry.